Ten on Tuesday, the sweater and yarn edition. 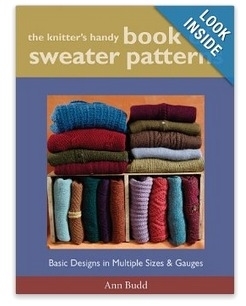 Five Favorite Sweater Patterns And Five Favorite Yarns To Use. The Incredible Custom-Fit Raglan by Pamela Costello. 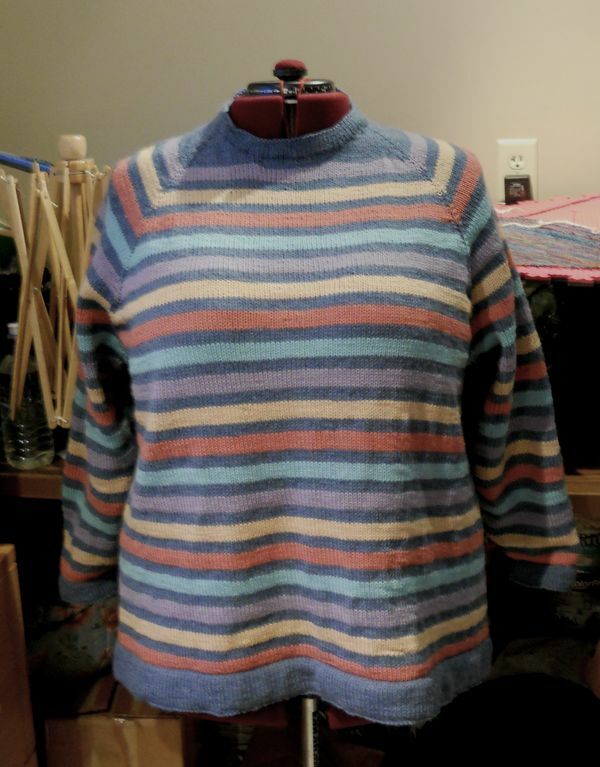 I used that pattern to make my multi-color striped raglan. Baby Brights by Bev Galeska. 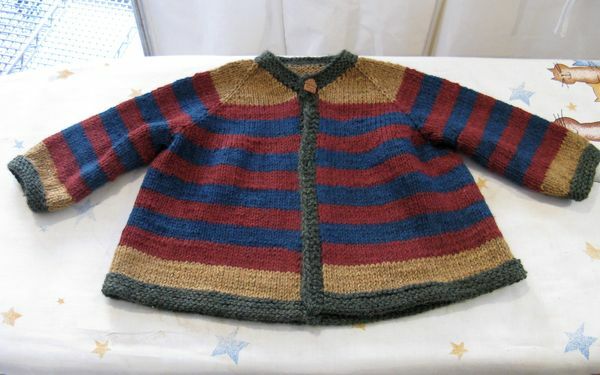 I have used that pattern for a couple of baby sweaters and have another one in the queue for a baby born last week. The first one above is done in DK and the second in light worsted. Math is my business. 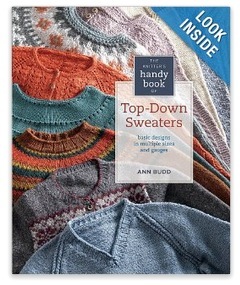 Any of the patterns in Ann Budd's A Knitter's Handy Book of Sweater Patterns and A Knitter's Handy Book of Top-Down Sweaters. As you may have guessed, I prefer to start with a basic pattern and do my own thing. 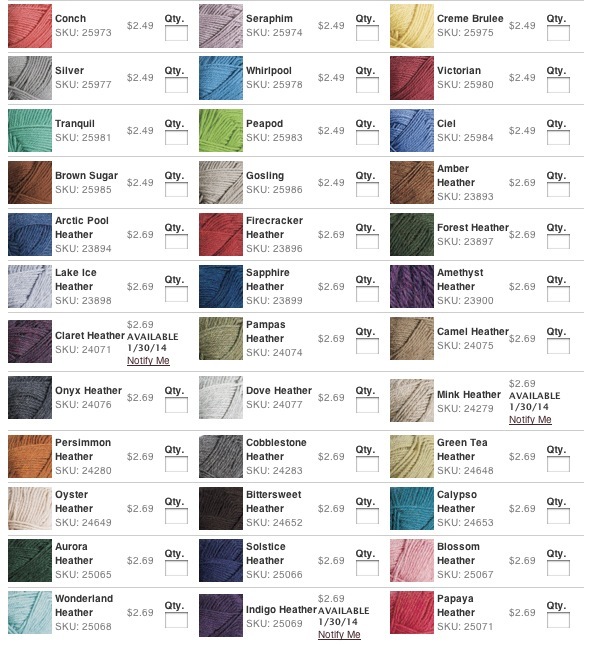 Next, the yarns, in no particular order. 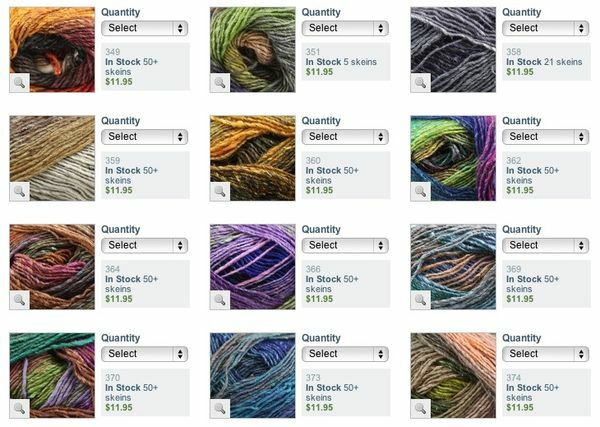 Frankly, I have not used a ton of different yarns and I tend to gravitate towards less-expensive ones. Knit Picks Wool of the Andes. 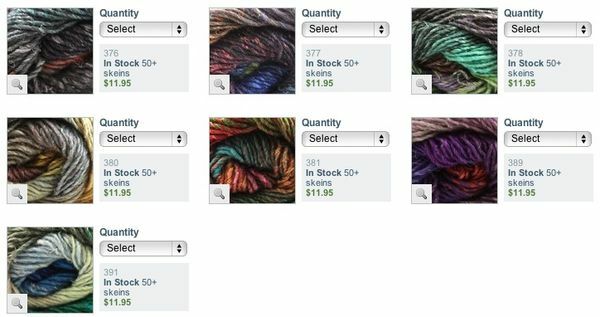 I prefer this to Cascade 220 because the worsted weight is slightly thicker. Haven't used the sport weight nor the superwash. Valley Superwash DK from Webs. 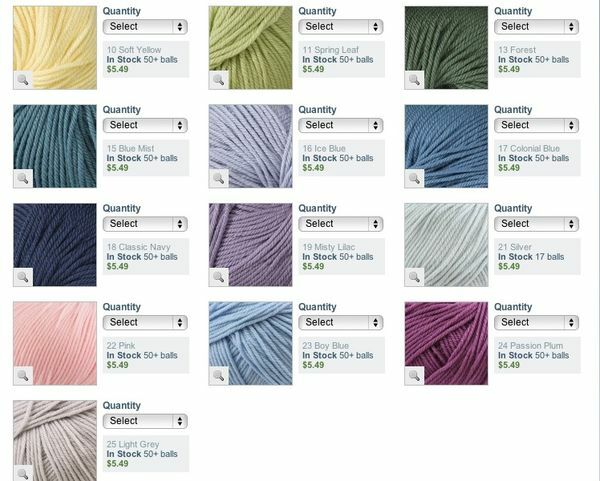 This is the yarn I used for my striped raglan in #1 at the top and the first baby sweater above. It really is completely machine washable and dryable, but it doesn't feel plasticky to my fingers. 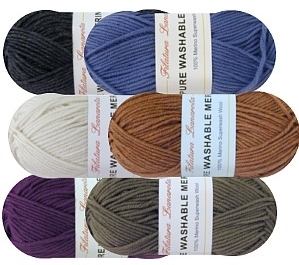 Lovely soft, sproingy merino that is easy care — perfect for baby projects. The superwash is important to me because I cannot convince myself that giving a new mother a garment that has to be hand-washed is a gift that will be appreciated. Tanis Fiber Arts Yellow Label DK. I have only knit a hat from this, but I loved the yarn, about which I said on Ravelry, "I loved this yarn. Merino, so no itch factor, but it still has a bit of the bite of real wool. It made beautifully 3D ribbing." Also NOT an inexpensive yarn. This entry was posted in Baby stuff, Sweaters, Ten on Tuesday, Yarn. Bookmark the permalink. 0 Responses to Ten on Tuesday, the sweater and yarn edition. I used Valley Yarns for Hannah’s Vivian sweater and I was very pleased with hit. How does the Knit Picks Wool of the Andes hold up? Cascade 220 pills like mad and I’m wondering if the Knit Picks does, too. This list is perfect! I’m currently spinning up some fibre for a sweater. 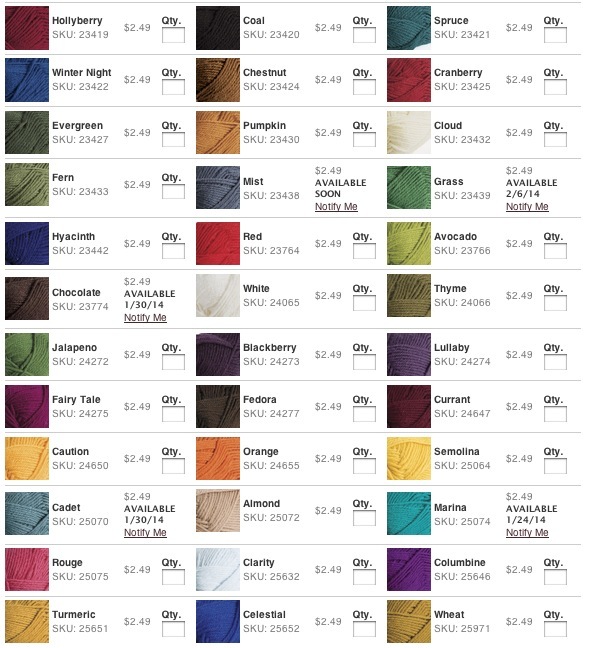 I haven’t picked a pattern yet, but this list is a great place to start! I’m a Bev Galeska fan (oh, those clogs! I’ve made so many of those clogs! ), and my Rogue in Wool of the Andes is my favorite sweater. 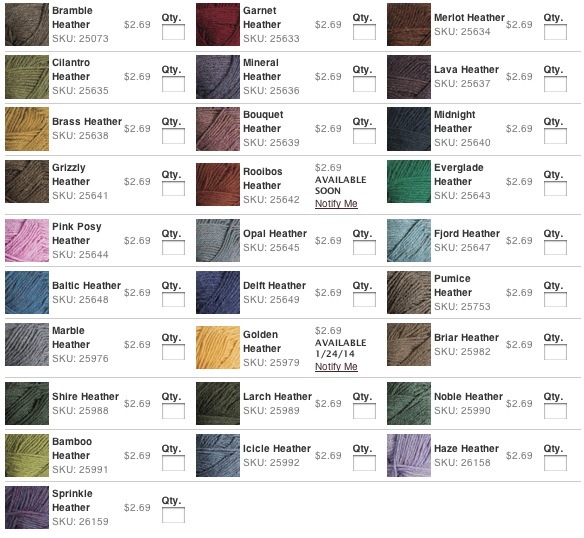 Haven’t tried the Noro, yet – I’ve drooled on it, but the price always gave me pause.